Lifts (also known as Elevators or Moving Platforms) are objects which appear throughout the Mario franchise. They are simply platforms which go up or down, in order to transport a game character or object to different heights. Some move by themselves, while others are controlled by the player. The ones in the Yoshi franchise have a distinct zig-zag pattern and are called Flatbed Ferries. 1.1.4 Donkey Kong Country 3: Dixie Kong's Double Trouble! Donkey Kong and Diddy Kong in the Elevator Antics level of Donkey Kong Country. In Donkey Kong, two sets of lifts appear in 75m: one set going up, the other set going down. Lifts appear to work via a chain-like mechanism. When an elevator reaches the end of its path, it disappears, and a new one appears at the beginning of the path, as opposed to a single elevator going up and down. Lifts also appeared in the Game Boy version of Donkey Kong. 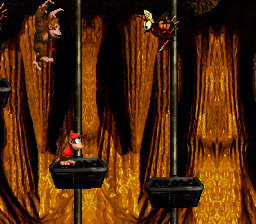 In Donkey Kong Country, many steel lifts are present in the level Elevator Antics. They can go either up or down. In Donkey Kong Country 3: Dixie Kong's Double Trouble!, lifts are wooden planks. Some are activated when Dixie Kong or Kiddy Kong ride them, and some are activated automatically. Mario riding a lift in Super Mario Bros.
Lifts are common in some levels of Super Mario Bros., first appearing in World 1-2, where they continuously move upwards or downwards with new ones being dispensed from the bottom or top. Some lifts move horizontally, while some, known as Flimsy Lifts, are stationary, moving downwards if Mario or Luigi stands on them. The lifts are solid, meaning Mario and Luigi cannot land on top by jumping through them. In Super Mario Bros.: The Lost Levels, lifts are made of mushrooms instead of metal. In Super Mario Bros. 3, lifts on rails known as Rail Lifts first appeared in World 1-6. The lifts in this game are wooden, much like the Hard Blocks in the game, and fall as soon as Mario or Luigi lands on one. The game also introduced moving Flimsy Lifts in World 1-4. Lifts reappeared in Super Mario World, this time with a gray or cream color. Most lifts in Super Mario 64 and Super Mario 64 DS have a tan-and-green checkerboard pattern on them. In some courses, such as Whomp's Fortress and Vanish Cap Under the Moat, pairs of lifts move along and rotate around both sides of a vertical beam, flipping when they reach the top. In Hazy Maze Cave and Lethal Lava Land, lifts move along chains of black spheres when stepped upon. Additionally in Hazy Maze Cave, large orange lifts with yellow and black trim appear to take the player between floors, and a unique controllable lift called the Work Elevator appears in one part of the world. Special lifts called Arrow Lifts appear in Wet-Dry World, moving back and forth when stepped upon. Also in Wet-Dry World, an Express Elevator appears embedded into some metal mesh. Stepping on the portion outside the mesh causes it to lower, at which point the player has a limited time to reach the portion inside the mesh, and ride it to a power star. In Super Mario Galaxy 2, lifts appear as yellow platforms that raise Mario up, then flash blue and disappear. They cannot be controlled by the player. They appear in Sky Station Galaxy and giant versions in Supermassive Galaxy. Lifts appear in the Nintendo 3DS game, Super Mario 3D Land, having the same design and function as that of Super Mario Galaxy 2. However, they never disappear, unlike the previous game. Lifts return in Super Mario 3D World, having the same appearance and effects as they did in Super Mario 3D Land. Lift reappear in Super Mario Maker and Super Mario Maker for Nintendo 3DS as tools. The direction in which they initially move can be pre-set, and they can move in a set path when placed on a track. When shaken, they turn into Flimsy Lifts, which are colored blue this time and will start moving on a track once stepped on. Lifts also appear in Super Mario Maker 2, where they can be seen varying in length. Lifts appear in Super Mario Run, where they run on Tracks in several levels. When Mario stands on a Lift, he stops moving until he jumps. After Mario gets off of a Lift, it disappears. 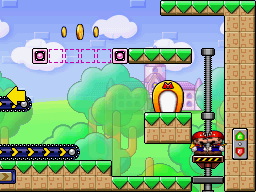 The lifts' designs are similar to the falling platforms in the final Bowser battle in New Super Mario Bros. 2. Lifts reappear in Super Mario Odyssey, where they have the same appearance as they did in Super Mario 3D World. Lifts that use their Super Mario Bros. sprites also appear in 2D segments. A few lifts are found in The Bitlands in Super Paper Mario. This time, they are pixelated and resemble the orange ones found in Super Mario Bros.
Lifts similar to the ones from Donkey Kong re-appears in Mario vs. Donkey Kong. Some of the directions that the elevator moves can be changed by jumping on a switch. Lifts can be used by Mini Marios in Mario vs. Donkey Kong 2: March of the Minis. They are first introduced in Mushroom Mayhem, Room 1-5, and then begin to appear in later levels in the game. The object has an attached platform connected onto the level pole. In addition, it also features a button that has two red arrows facing away vertically. To use them, the toy has to get onto an lift first by guiding with the player's stylus to get onto it. Then, the player must use the button by using the stylus to tap on one of the two arrows if the lift would elevate or rise down. Once tapped, the lift cannot be interrupted by tapping on the button again until it reaches to a certain level to stop on. In addition to using them, the lift can hold up to two Mini Marios. In Super Smash Bros. Brawl, lifts from Donkey Kong appear in the stage 75 m, which also reappears in Super Smash Bros. for Wii U and Super Smash Bros. Ultimate. They act same as they do in the original Donkey Kong due to the stage being an exact remake of the original level. Lifts also appear in the Mushroomy Kingdom stage, with the same placement and function as in World 1-2 of Super Mario Bros., though they now appear as rusted, due to the stage's aged appearance. In Super Smash Bros. for Nintendo 3DS, lifts from Super Mario 3D Land appear as platforms in the auto-scrolling 3D Land stage. The match begins on three stationary lifts. During the second portion, players fight on four multi-colored lifts as they transition them to the third portion of the stage; on the way there, some platforms may collide into protruding rocks, altering their angle. In PictoChat 2, one of the drawings that may appear is a row of blocks between a pair of continuously moving lifts from World 1-2 of Super Mario Bros.
Lifts can be used by Yoshi in Yoshi Topsy-Turvy. They come in a green zig-zag pattern and a brown rocky pattern and are attached to chains by rails. The patterns are just for show and do not affect the lifts' behavior. When the player tilts their Game Boy Advance system, the lifts will swing back and forth and move along the rails. Small Lifts also appear, which are miniature versions of lifts. They come in the same two patterns as normal lifts, but they are not attached to rails and will only swing when the Game Boy Advance system is tilted. Lifts reappear in the Nintendo Switch version of Captain Toad: Treasure Tracker, replacing the Propeller Platforms due to the lack of the microphone. ↑ Musa, Alexander, and Geson Hatchett. 2013. Super Mario 3D World Prima Official Game Guide, page 167. ↑ Super Mario Bros. 3 English instruction booklet, page 19. ↑ Super Mario Bros. 3 Japanese instruction booklet, page 17. This page was last edited on March 6, 2019, at 17:53.